Welcome back to the Comic Book Herald reading club. This week we read John Michael Straczynski (heretofore titled JMS) and John Romita Jr’s Amazing Spider-Man #30 to #38. If you only read to issue #37, well that’s because that’s where I (foolishly) cut off the suggested issues in the club e-mail. I had intended to reference issue #38 as well, and since issue #37 ends on a tremendous cliffhanger, hopefully you ignored my silliness and continued. If not, I highly recommend you do so before reading any further! I wrote a good deal in our week one Busiek & Perez reading about the state of Marvel following the Onslaught epic into Heroes Reborn (1996 – 1998). This weird and wild state of affairs affected Spider-Man as well, with Peter Parker running through a Norman Osborne infused “Gathering of The Five” story arc that involved whole lot more clone saga, Spider-Man family and character resurrection than I’m going to discuss. 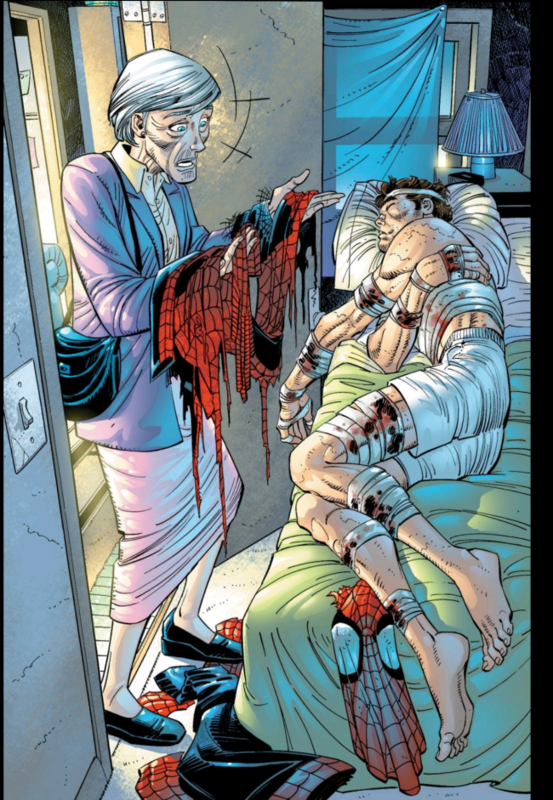 For all its flaws, the 1998 reboot of Amazing Spider-Man #1 gets one thing right: Peter Parker as Spider-Man, married to Mary Jane, with Aunt May operating as a close 1a in terms of the most important woman in his life. It’s a state of affairs much more in line with the Spider-Man you likely recognize, either from the movies, cartoons, or older comics. Spidey Comedy as Stan and Steve Intended! That said, Amazing Spider-Man really just never finds its stride for the first several years. The series frequently intertwines with a concurrent Peter Parker: Spider-Man title, and it’s actually within Peter Parker: Spider-Man that Paul Jenkins creates the most interesting read from this era: “The Revenge of the Goblin” miniseries (concluded in Amazing Spider-Man #25 and Peter Parker: Spider-Man #25, in that order). But again, it isn’t until the creative team of JMS and Jr Jr take over with Amazing Spider-Man #30 that we get truly memorable Spider-Man comics, and stories that have come to define this era of Peter Parker. I won’t go so far as to say these comics saved Spider-Man because he’s a hard hero to kill, but they certainly provide his character purpose and direction, and made Amazing Spider-Man essential again. 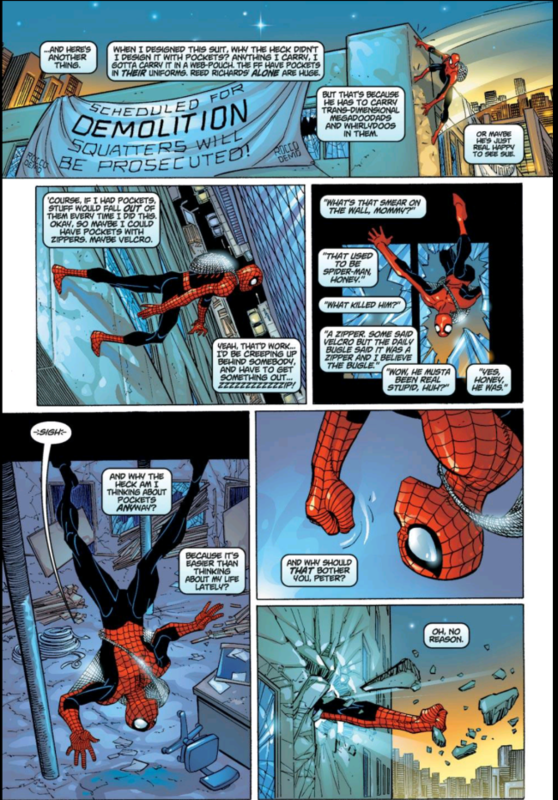 One of the core Spider-Man issues over the years has been how much change might be allowed into his life. In the early Stan Lee & Steve Ditko years, this was much easier. Peter Parker becomes Spider-Man and grows up right before our very eyes, attending Empire State University and falling in love with Gwen Stacy. Once Peter hits college, though, the progression begins to slow. Hang on… if he becomes an adult, do we lose the appeal of this character? How old can our teen hero get? As a result, there’s a lot of wheel spinning in the life of a perpetually early 20’s male. Peter has a hard time with rent money, has girl troubles, beats the snot out of Rhino… rinse! The changes that Peter does experience resonate a lot more strongly as a result: The death of Gwen Stacy, the Black Venom symbiote, marrying Mary Jane, finding out he’s a clone (wait, hang on, who’s the clone? )… you get the idea. Part of the reason JMS and Romita Jr’s run works so well is that they were able to identify the necessary changes in Peter’s life that could give readers a fresh take on the same character we know and love. The first, and possibly most effective choice is to lead Peter to a new career as a high school science teacher at his old school, Midtown High. 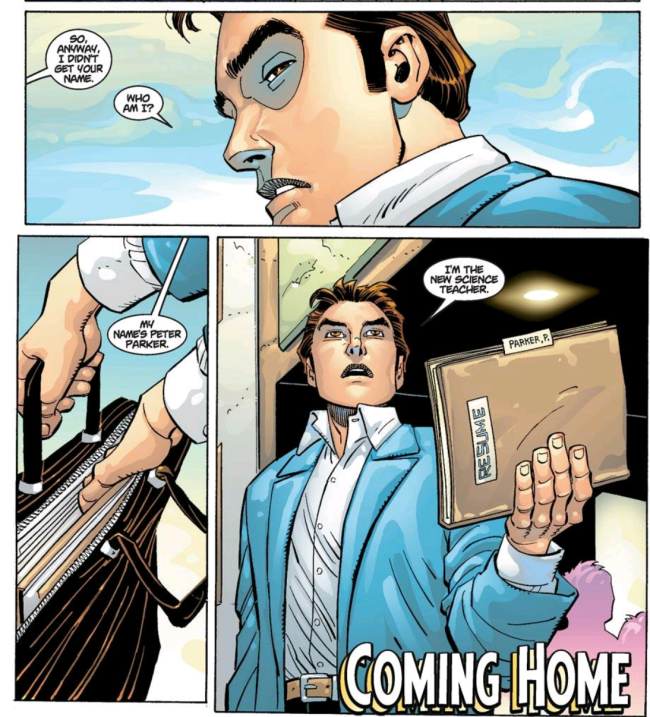 This is such a brilliant move because the creative team found a way to return Peter to high school – where all of the Amazing Spider-Man began – without up and rebooting and making him magically younger. As several readers highlighted in the forum discussion this week, Mr. Parker is also particularly well suited for his role as teacher in a battered high school. He gets to display his unrivaled scientific acumen, his gift for gab (often concealed as Peter Parker), and most importantly, his extraordinary empathy and desire to help. This is a school chalk full of young, troubled teens in need; the once horribly bullied Peter Parker understands like few high school teachers could. From this an entirely imaginative bit of “What If? !” plays out with Spidey’s powers stemming from “totemistic” powers-that-be, who have also bestowed their spidery gifts on others, such as the all-new character Ezekiel. Regardless of this inversion of Peter’s origins (I’d argue the thought experiment doesn’t ultimately change that much), the new characters that result are where JMS and Romita Jr really stick the landing. The mysterious Ezekiel – this spider-powered billionaire who knows everting about Peter, including his secret identity – and the unstoppable and terrifying Morlun are extremely effective from the beginning as Spidey attempts to understand this new nature of his origin. There are so many new characters in comics that never really stick that it’s easy to look over how permanent Ezekiel feels from that very first conversation, stuck to the skyscraper with barefeet just like Spider-Man would be. Morlun is less instantly captivating for me, but he quickly becomes a force to be reckoned with, the rare villain of Spider-Man’s who can’t be beaten in a fight. Morlun absolutely wails on Spider-Man, and while I’ve read plenty of comics where Spidey gets beat up, I’ve rarely felt his odds were so hopeless. This makes his determination and courage stand out that much more, which is a testament to why we love this hero in the first place. The final change, and the one that probably excited me the most, was Aunt May’s discovery at the end of Amazing Spider-Man #35 that Peter is Spider-Man (spoiler!). The rest of the issue is completely riveting as we – finally – after 40 years of Amazing Spider-man get to see Aunt May and Peter resolve the lie at the center of their otherwise beautiful relationship. We’re at the point in the reading club where the selections will prove pivotal in defining a character or team’s status for the decade to come. For Spider-Man, the JMS and John Romita Jr years set the stage for Peter Parker all the way through his role in Civil War, or approximately 2000 to 2008. 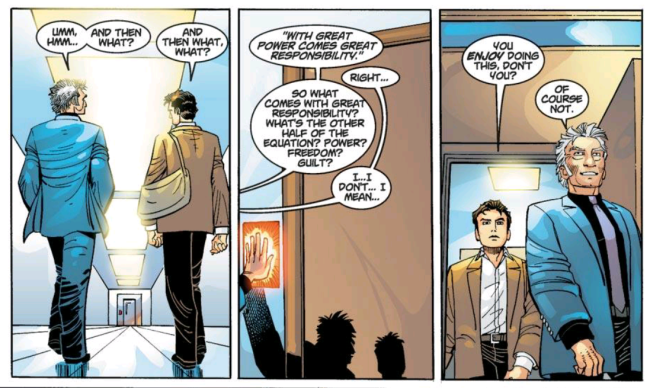 There are some outstanding highs – the Civil War and “Back in Black” story arc that followed come to mind – and some atrocious lows – I’m looking at you “Sins Past” and “One More Day” – but all in all, it’s one of my favorite eras of Amazing Spider-Man simply because it pushed Peter forward. The best suggested reading I can lay out for you would be my modern Amazing Spider-Man reading order. Keep this in mind as you progress with Spider-Man stories in your reading! We have a good idea now of what the Avengers and Spider-Man look like in the early 2000’s. But what about the Marvel staples that saw the biggest changes? What about the X-Men? For week 5, we’ll read some selections from Grant Morrison and Frank Quitely’s critically acclaimed and hugely popular New X-Men. Spider-Man isn’t perpetually in his early 20s. Ignorninghow when you do the math he’s over 30, he is the same age as jessica Jones who has been stated to be 30 and in 1995 he was stated to be 25.